I am not sure if they were mocking me or squawking with encouragement as I ran through the cemetery today but the 50 or so obnoxious crows kept me company on an 11.25 mile run. I was able to will myself out the door with enough time to go for a longer distance and not have to race the sunset. Despite feeling slow and cumbersome with a crooked gait I enjoyed being out in the fresh air and sunshine. Ten degrees cooler makes quite a difference in comfort. I was anticipating the same 43 degree warmth as 2 days ago and was forced instead to keep my gloves on. 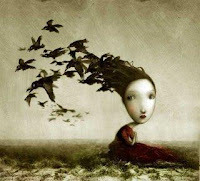 My body rebelled against the chilly wind yet the crows gave me much to imagine and may have pried my subconscious fears to the surface. Worst case scenarios that I will not utter aloud as to not tempt the fates kept popping into my mind. Breathing and staying in the moment took focus and determination. My mojo had been replaced with weariness and it felt as though gravity itself was angry with me and pushing me to the earth with more force than usual. When Jaymon showed up with the 3 younger spawn on a walk, I had difficulty not ditching the run altogether and walking and playing with them. It warmed my heart to see them when I was feeling lonely and cold yet as they walked away the fears surfaced again and I had to fight to focus on my breathing and find the grace of putting one foot in front of the other. The harbinger's of death often sounded like children screaming and crying and I quickly told myself to knock it off and think instead of the birds of wisdom and messengers that crows are considered to be in other parts of the world. 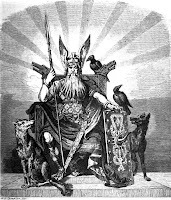 In Nose mythology Odin had a pair of ravens named Hugin (thought) and Munin (remembrance) living upon his shoulders or throne. Each morning they flew around the earth observing everything and questioning everyone, even the dead. During the night they returned to their master and whispered all that they had seen and heard. Sometimes Odin himself turned into a raven. 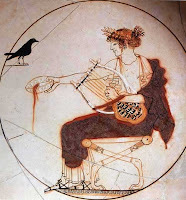 Apollo used pure white crows as his messengers but upon hearing that Coronis, a Thessalian nymph whom he passionately loved was unfaithful to him he shot the nymph with his dart and hating the crow turned him black as coal. It is said that crows are useful in finding lost objects and I would imagine this is due to their curiosity and fascination with shiny objects. They not only mimic other birds but can mimic falling water and music from a music box. Important in celtic lore the raven-crow goddess, The Blessed Raven, has a threefold function as war fertility and prophecy. They seem to live and roost in the cemetery I run in. I have seen them during all seasons and have been chastised by them many a time. It made my run interesting and memorable and fodder for my imagination. Here is a video of how clever crows can be.